Presented here are postcards from the Robert Ley. Several factors can turn a seemingly normal postcard into something so much more - postmark dates, what is written, where it was mailed from, and the image itself. Below are the photo descriptions left to right per row, with dates in bold white and important notes in red. Some of the following postcards are one of a kind. At the bottom are full translations of each postcard thanks again to the members of feldgrau.com. 2. Back of card: April 15th, 1939. Standard ship cancellation. 4. Back of card: August 12th, 1944. Written out during her time as an accommodation liner - Just over 5 months before the Gustloff was to be sunk. 6. Back of card: April 5th, 1939. Standard ship cancellation. Written pre-maiden voyage. The voyage before her maiden voyage was a special trip to take Germans to see the launching of the Battleship Tirpitz (sister ship to the famed Bismarck) in Wilhelmshaven. The trip lasted 5 days - March 31st until April 4th, 1939. 7.Artists rendition of the Robert Ley before she was built. Because she was yet to be completed, the statistics on the back did not necessarily match the finished liner. 25,000 BRT on the card compared to 27,288 BRT when finished. Other stats are accurate: 204m long, 24m wide, 54m from keel to mast. 420 crew and 1,770 passengers. Speed 15.5 knots. 8. Back of card: April 8th, 1939. Posted on her maiden voyage. 10. Back of card. August 24th, 1939. Posted on the final day of her last voyage! On August 25th, she was to be requisitioned and converted by Techn. Betrieb HAL, Hamburg into Lazarettschiff B. 11. Dining Room of the Robert Ley. 12. Back of card. May 9th, 1939. Stamped "Let's Educate You In Air Protection." 14. Back of card. May 30th, 1940. Posted during her time as a hospital ship. 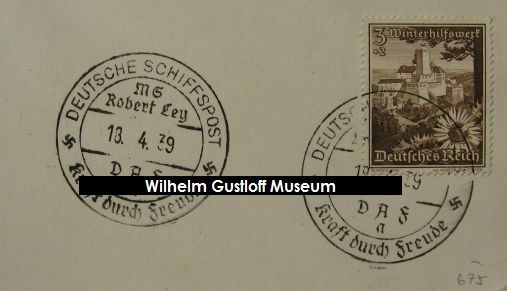 15 - 28.The next 7 postcards were all written by Gerta Schol to Arthur onboard the Robert Ley during her April 9th-15th, 1939 voyage to the Norwegian fjords. 15 - 18. Fronts and backs of the April 9th postcards. 19 - 20. Front and back of the April 10th postcard. 21 - 24. Fronts and backs of the April 11th postcards. 25 - 26. Front and back of the April 12th postcard. 27 - 28. Front and back of the April 13th postcard. 29. Beautiful shot onboard the Wilhelm Gustloff of the Robert Ley being passed at sea. 32.E.S. Robert Ley in Hamburg. The last 7 postcards are unused, so only the front image is shown. Grüsse u. viele liebe Küsse. Dich Dein lieber Menne (?)! Hitler (?) ... K.d.F (? 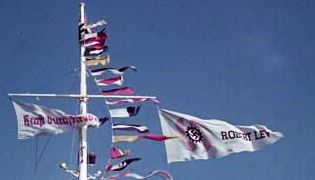 )-Schiffe Ley u.
Morgen wollen wir nach St. Tomorrow we'll go to St.
My dear! Before we embark I would in advance like to wish you all the best [dear, good and nice] for Sunday. Because mailing is not possible from underway, I wouldn't want to leave you without a Sunday's greeting; so please accept it today already. This afternoon the weather turned nice and since 3 o'clock the sun is shining. We are now sitting and listening to music in the café in St.Pauli-Reeperbahn, where I am thinking of you. Best wishes to you and the children and have a good time on Sunday. Arthur. Dear Lore! I've been aboard on the ship since 24h and have settled well. I relish the food (table 37); I am the best eater of us 8 people at this table. In the theatre hall there is now a presentation about the North Sea. Best regards to you, mum and Eberhard from your father. schlafen. Heute ist herr-liches Wetter und fahren wir jetzt (11 Uhr) bei Koper- vik. Dir, Mami und Lore herzl. Grüsse Dein Vater. Dear Eberhard! Like yesterday, I took a delightful sunbath at the swimming pool this early morning. Yesterday afternoon it was raining, wind force 4-5, in the evening [wind force] 7, they said there was a thunderstorm at night, I didn't hear anything but was sleepling blissfully. Today the weather is marvelleous and now (11 o'clock) we are passing Kopervik. Best regards to you, mum and Lore from your father. My dear! We are now in the fjords, where every moment there are different views. Now at 5 there is a concert for strings in the theatre hall; from 8 o'clock there will dancing [in the hall]. So far I survived the journey alright; today the weather is good and the sun is shining. Affectionate regards to you and the children. Arthur. und verläuft gut. Herzliche Grüsse dir und den Kindern. My dear! Today we come from the Sør-, Hardanger- in the Maurangerfjord. Yesterday in the evening around 7 o'clock we reached Bergen, where the ship turned round. Early this morning, at 5 o'clock I could see the snow mountains [Schneeberge = name?] from my bed. The journey is lovely and goes well. Best regards to you and the children. Yours, Arthur. morgen früh 8 Uhr vor Helgoland sein; die Fahrt wurde um 7 Stunden ver-längert. Heute ist prächtigster Sonnenschein. Dir und den Kindern herzlichste Grüsse und einen Geburtstagskuss! In Liebe Dein Arthur. My dear! At the present Sunday I am thinking of you with love and sending you my heartiest congratulations again. We are now on the way back to the North Sea and should arrive in Helgoland tomrrow morning at 8 o'clock; the journey has been prolonged by 7 hours. Today the sun is shining magnificiently. Affectionate regards to you and the children and a birthday kiss! With all my love, Arthur. 2. Back of Card: Postmarked May 4th, 1940. From Lazarettschiff 'B'. 4. Back of Card. Postmarked April 19th, 1939. Written one day into her maiden voyage. 6. Back of Card. Postmarked July 4th, 1944. During her time as an accommodation liner. 7. The E.S. Robert Ley. 8. Back of Card: Postmarked April 4th, 1939. During her pre-maiden voyage to take Germans to see the launching of the battleship Tirpitz. 10. Back of Card: Postmarked July 23rd, 1939. 8 days before the outbreak of war. 11. Robert Ley sailing our of Hamburg. 12. Back of Card: Unknown Date. 14. Back of Card: Dated April 5th, 1939. From her -2 voyage out of Hamburg. 15. Great view at sea from the Robert Ley's starboard bridge wing. 16. Back of Card: Previously unseen postal stamp. No date. Wir wohnen hier wie die Fürsten. Sonst geht es mir gut. Vorläufig bitte noch keine Wäsche und Schuhe schicken. Liebe Frau Sauer! Will mich nur kurz vorstellen: Bin ein Kamerad von Walter und ……. Briefverkehr. Dadurch dass sich nun unsere Kommandos geändert haben, bitte ich Sie herzlichst um seine jetzige Anschrift. Es grüßt sie herzlichst unbekannter Weise. Ihr Franz Müller. „Dear Misses Sauer! I just want to introduce myself: I’m a comrade of Walter and ….. written conversation. Due to changes in our assignments I want to ask you for his new address. I send you, unfortunately not knowing you personally, my dearest regards. Yours, Franz Müller.
? W. Heidrich ? ____? We are already on the proud ship Robert Ley. The ship is equipped excellently. but everything else is fine. 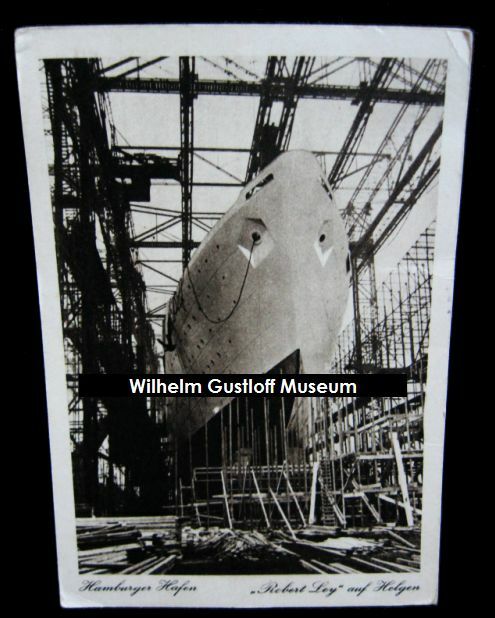 Postcard of the Robert Ley being built.